The beetle about to fly away. We can see its hind wings which are normally folded under the forewings cover. 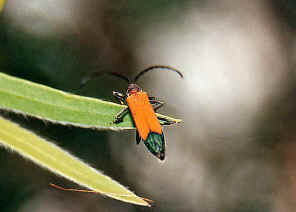 Beetles only use their hind wings for flying. 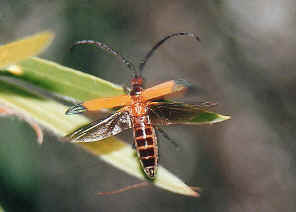 The harden forewings are used as the protection to their hind wings and abdomen. When fly, the forewings are just open and have no or very minor aero-dynamic effect. This may not be a longicorn beetle although it has long antenna. Last updated: April 05, 2011.